Official TownMe Blog: Best of the Web! What are the best restaurants, spas, and plumbers in your town? Best of the Web! What are the best restaurants, spas, and plumbers in your town? The web is a big place and it's often hard to find the key information you're looking for. For example, when I search for "Best Chinese Restaurant" in San Mateo I get 209,000 search results on Google. If I click through to a review site, each site will have hundreds of reviews each with a different opinion about what the best Chinese restaurant is. After half an hour of scrolling I am left with a lot of back and forth, a lot of different star ratings, and no Chinese restaurant... and my eyes are sore. It's often hard to see what is mere opinion versus what is fact or consensus. To help make it easier to find the best business on the web, we have looked at the rankings, positive feedback, and other signals in web sites from across the web to compute the best of the best. This has resulted in our "Best of the Web - Best of Lists" e.g. for San Francisco. 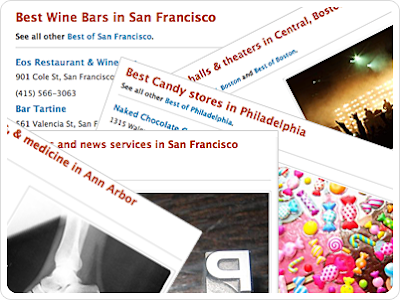 We have also broken down these best of lists by neighborhood e.g. the University District in Seattle Best Ofs so you can see what the best bars, best Japanese restaurants, best florists, best bike rentals, or best whatever are in your area. To get to neighborhood specific lists, just scroll down to the bottom of the city list. Like this post? :) You should follow us on Twitter here.